What a nightmare! When you awake in cold sweat you only remember dazzling colours, flash-lights, dark shadows with far too many arms and the sickening sensation of being dropped from a high place. You spent a few seconds to gather your wits before opening your eyes and sitting up. A metallic ping sounds as you smash your head on the panel overhead. Panel? Confused you start noticing your environment for the first time. No, this is definitely not your bedroom. Not unless your partner has drastically redecorated your home over night in a fit of SciFi inspired madness. You sit on a metal bank in small, metal alcove in a tiny metal room which is strangely aglow in blueish light. A soft humming fills the air which smells oddly of cinnamon and sea water. A perfect circular panel on the side wall seems to be a door, and indeed, as you approach it, glides sidewise giving the way in an equally shaped aisle. A succession of blue blinking lights on the floor seems to invite you to follow along, and in the absence of any other thing to think of, you follow suit. The aisle ends on another semi-transparent, circular door through which you see a humanoid figure standing in front of some large glowing thing, which you can not make out any clearer. The figure is touching things on the rim of that thing and suddenly a high shrieking sound is heard which makes you clap your hands on your ears. There is a lot of light coming from the door, mostly yellowish red, and the brightness of it blinds you for a moment. When your vision returns, the ambient light is blue again, but the figure is nowhere to be seen. The door opens in front of you and you stagger into a larger room. It smells oddly of burnt flesh. You can now see the object that fills the majority of the room. It is a ring of floating blue orbs, roughly man-high and slowly vibrating. The orbs have glowing symbols on them, and something tells you that they can be touched to be activated, which was apparently exactly what the figure before you did. 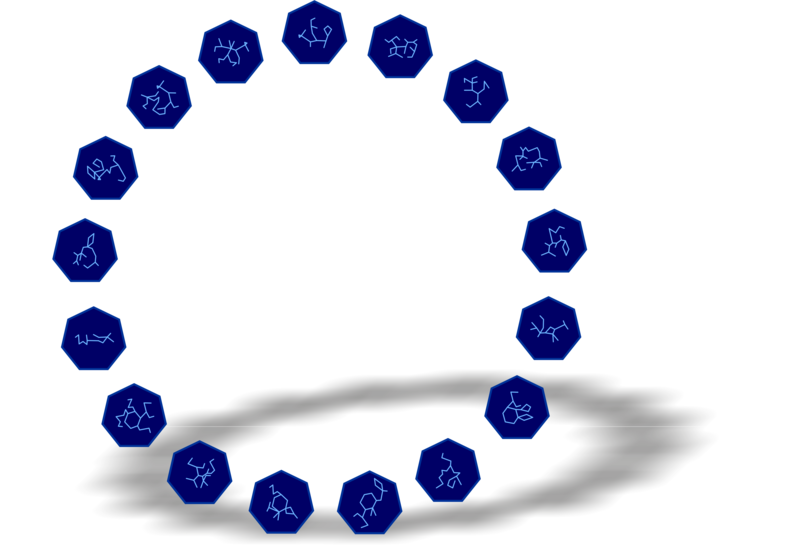 Next to the ring, two to the left and two to the right, are four freestanding panels of blue, semi-transparent appearance. They seem to be made of the same blue crystal material as the orbs and they also have a faint glow. However, they seem to be static and can not be interacted with. Other than that, nothing is in the room, and just when you consider checking back on the room you arrived in, the door closes behind you and seemingly disappears into the wall, which now is perfectly flat all around. How can you escape from this room? The following hints are not needed to solve the puzzle. They are spoiler-tagged for a reason! Hopefully, I can add them with increasing "spoiler-ness". Be observant. Use the full-res images and a suitable medium to display to not loose out on details which could be important. You are dealing with aliens! Some things may be indifferent to this ("global truths") but other things may not. Start with panel 4. If you read it and understand it, you're a huge step closer. These aliens seem to have a weak spot for certain numbers. Maybe there are some hints hidden in that? Special thanks to GarethMcCaughan who did a lot of the heavy lifting on the math in the steps on Panel 4.
as mentioned by Verence, has squares going down the left and right sides. Starting from the top (at the circle) and travelling down the left, the number of squares is the number of primes factors for each number. The right side is the number of distinct factors for each number. 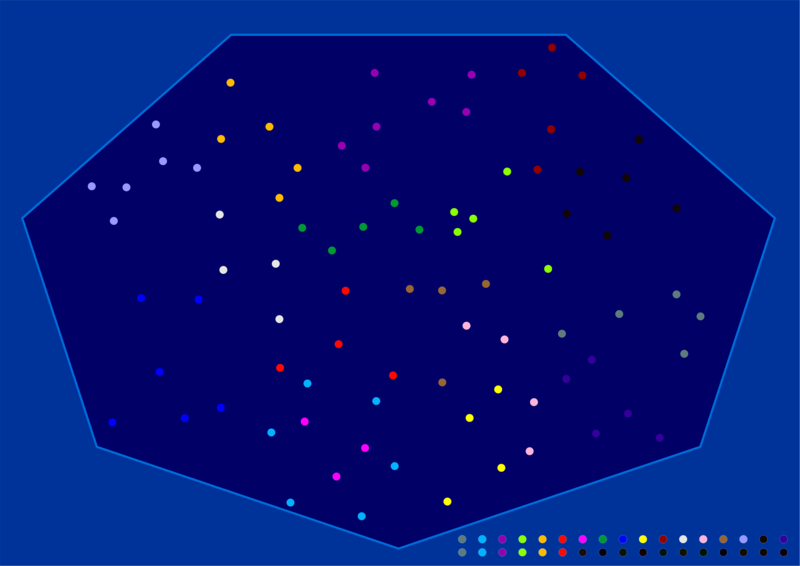 This leads us to be thinking about all of the operations on Panels Two and Four as prime numbers, with each of the colours representing one of the first 17 primes. The operations that have been previously mentioned as "U" and "V" operations refer to multiplication and addition of the prime factors. 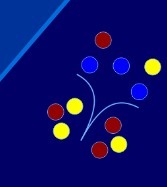 This equation is only possible if 3 is yellow and 5 is red. 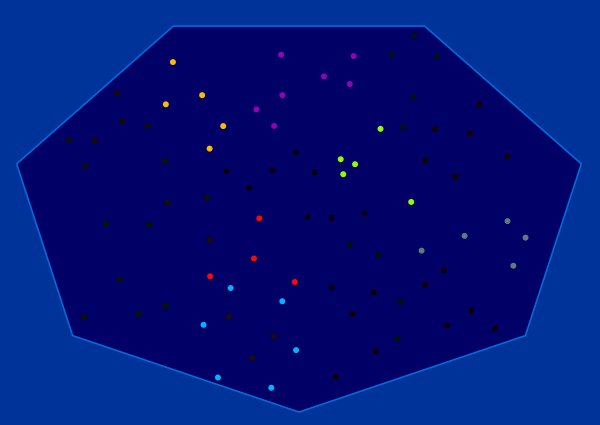 There is one colour not listed in the fourth panel that appears as a constellation. It is the purple in the West of Panel 2. It must be 47, but we will confirm this. Plucking all of these constellations from Panel 3, and then finding the match in 2012rcampion's solution yields that we should push #2, #4 and #11 to get home! are all actually colored, just very dimly. Of course my actual answer is just to activate the positions highlighted in P1. It is very obviously communicating that those positions lead to Earth. 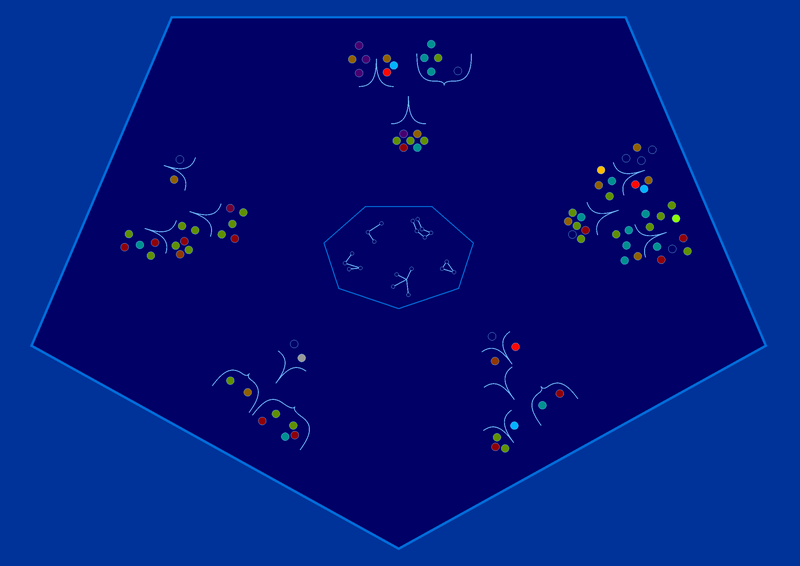 I completed the @Sleafar's constellations on Panel 3. Not all of them can be found on Panel 1. However, these are the parts from which figures at the gate are made, and the remaining constellations from Panel 1 are not used directly. I also marked them on the gate picture. There are two types of figures on Panel 4. I call them "U" and "v"s. These figures are also present on Panel 2, but this time the picture looks like it's incomplete. 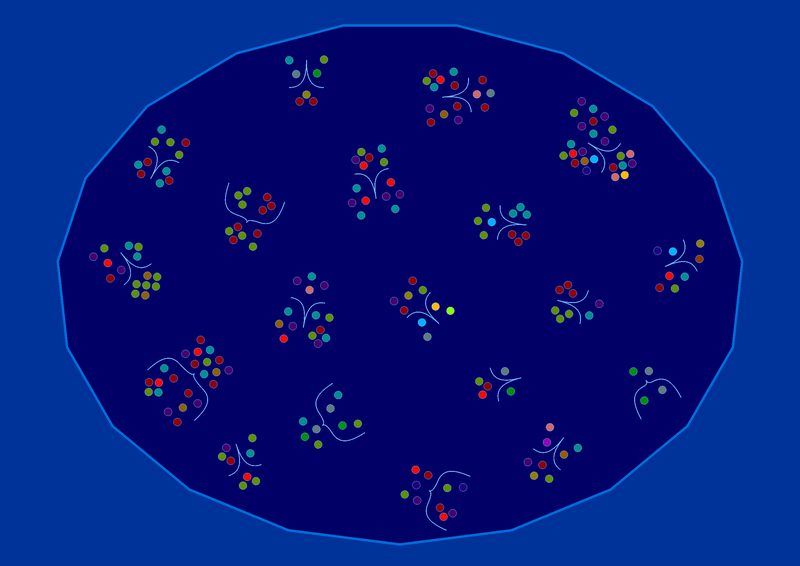 The coloured dots are related somehow to the constellations on Panel 3. 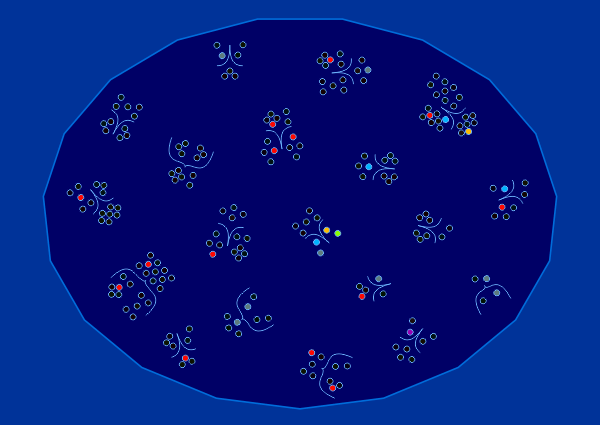 Panel 2 also has dark blue dots. I suppose that they are related to the constellations in the middle of Panel 2, presumably each figure takes a constellation from the opposite side of the inner pentagon. "U"s look like a combine/split operation, which is also suggested by their shape (a curly bracket). They have two groups of dots inside and a larger group composed of exactly the same dots outside. 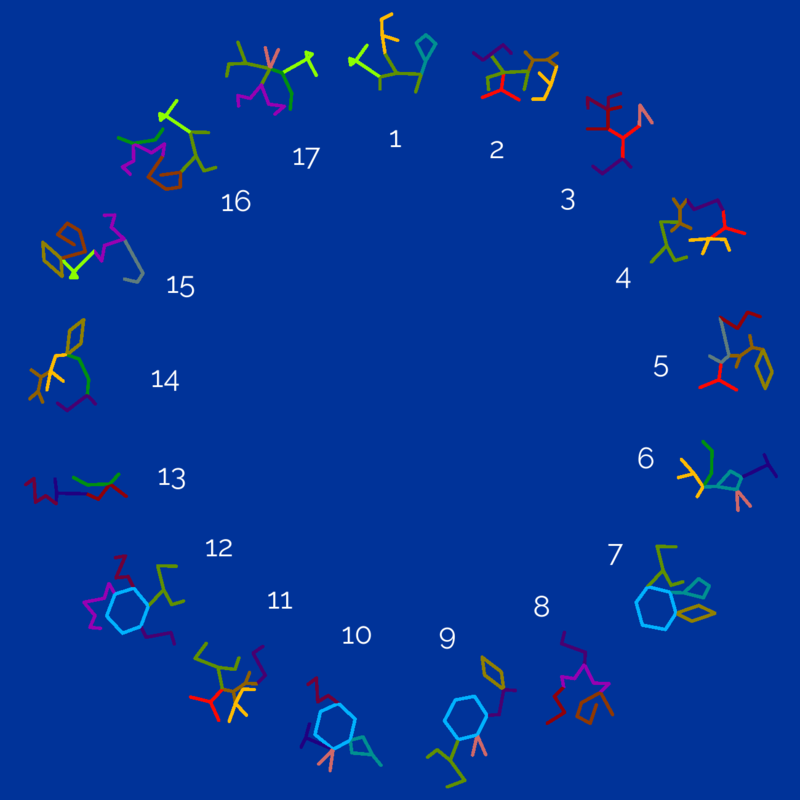 - The Star Gate contains 17 heptagons. 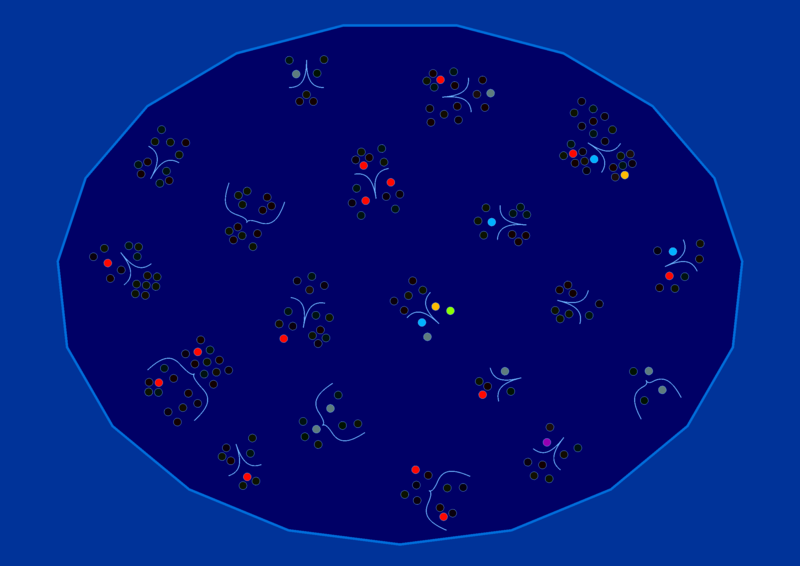 Each of them contains a combination of constellations from Panel 1. 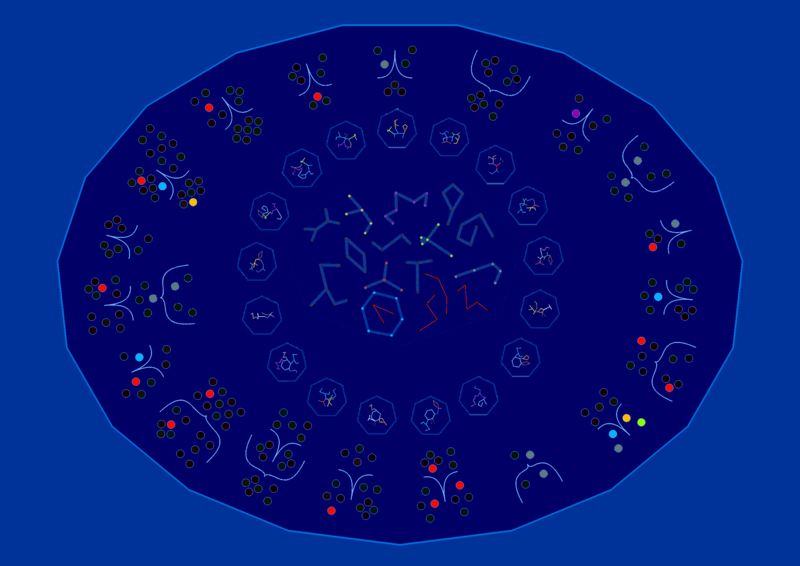 - Panel 1 contains a smaller version of the Star Gate where 3 heptagons are highlighted. 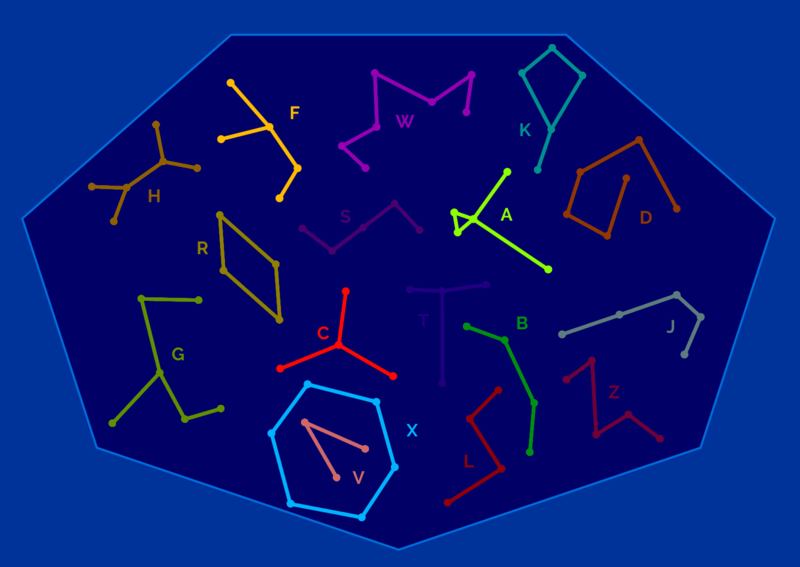 It also contains 18 constellations. - Panel 2 contains a pentagon with 5 groups of stars. 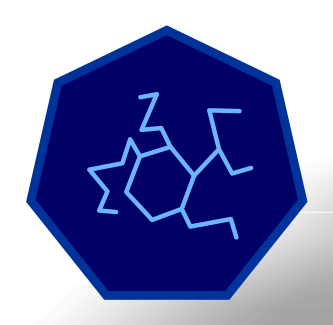 It also contains a smaller heptagon with 5 more constellations. 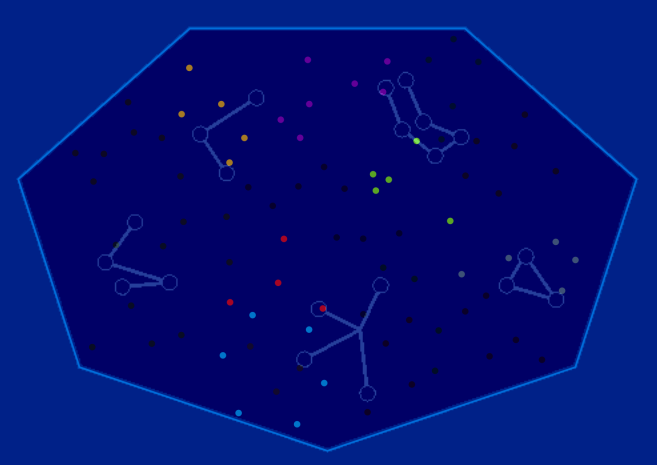 - Panel 3 contains a heptagon with stars, there are 6 colored star groups. 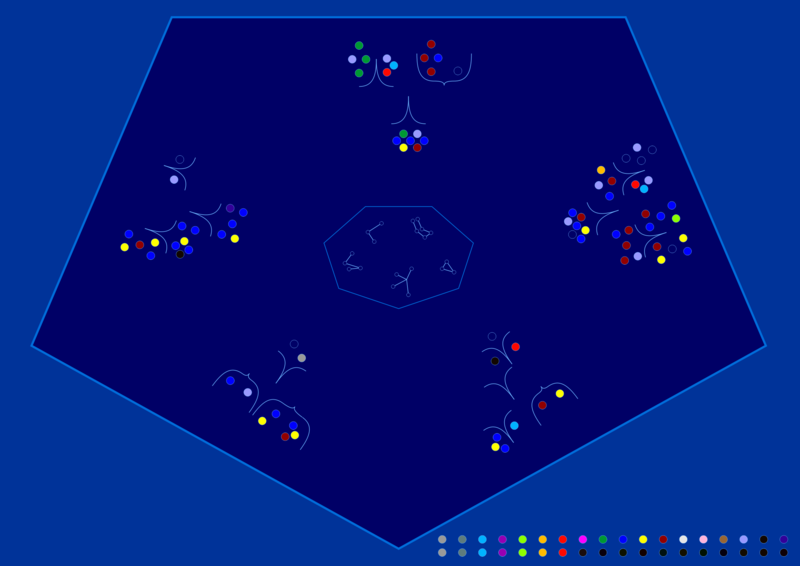 - Panel 4 contains a polygon with 19 sides and 19 groups of stars. The 18 constellations from Panel 1 plus the missing hexagon match the number 19 from Panel 4. Not a solution; these are just interpretations to give direction. Spoiler block may be unnecessary, so it may be removed if the community prefers. 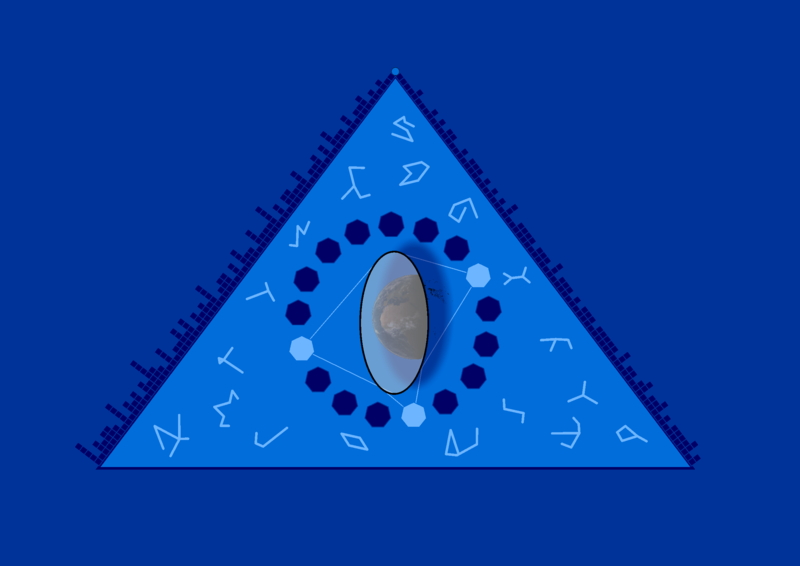 Panel 1 appears to suggest that we simply need to touch the correct three orbs to open the escape portal, which we should be able to identify by rotating the ring into the correct position. The puzzle then becomes figuring out the correct orientation of the ring. 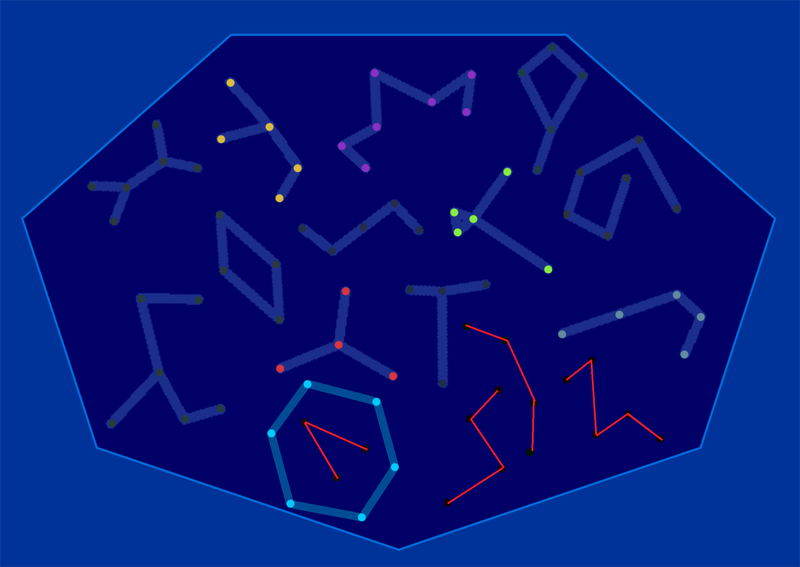 The matching shapes probably mean each pedestal is related to another. For example, panel 2 has a centralized 7-sided figure surrounding a variety of constellations, and panel 3 is a 7-sided figure with dots. 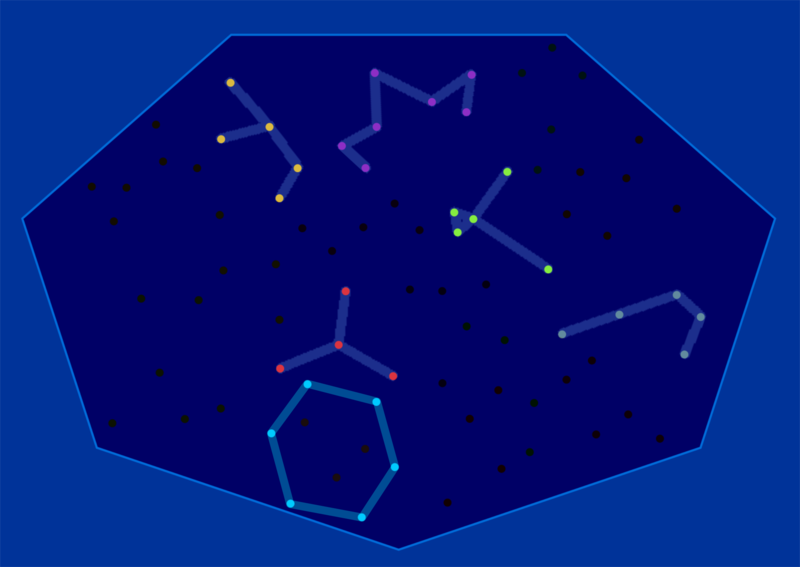 If we consider these to be related, then we can overlay the constellations from panel 2 on panel 3 to figure out which of its dots are connected. Not a solution; also just interpretations. The buttons you press forming a V like that shown in panel 1 might correspond to the different V's from panel 4 (and possibly also panel 2). That's the only way the colors seem to make sense. 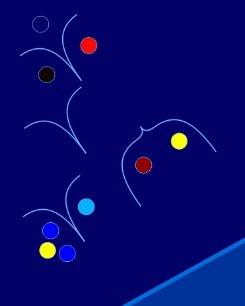 I noticed that the blue and red dots in panel 2 are always next to each other, and on panel 3, the blue and red constellations are also right next to each other. That's what gave me the idea. The mirror or whatever is shown in the middle of panel 1 is clearly a picture of the Earth. If you zoom in on the linked HD image, you can see Europe and can also see that Italy's boot is quite obvious. Probably others have noticed this, but no one had pointed it out yet. Not the answer you're looking for? Browse other questions tagged mathematics enigmatic-puzzle visual or ask your own question.